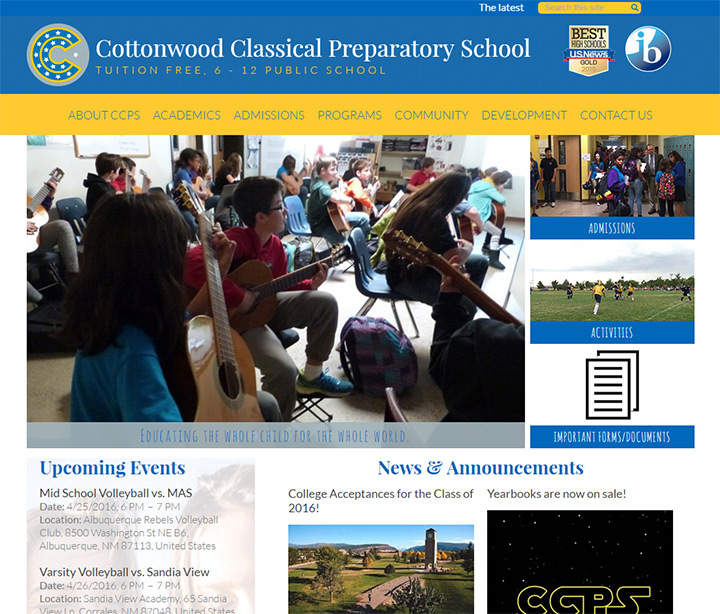 It’s surprisingly difficult to find quality designs for public school websites. 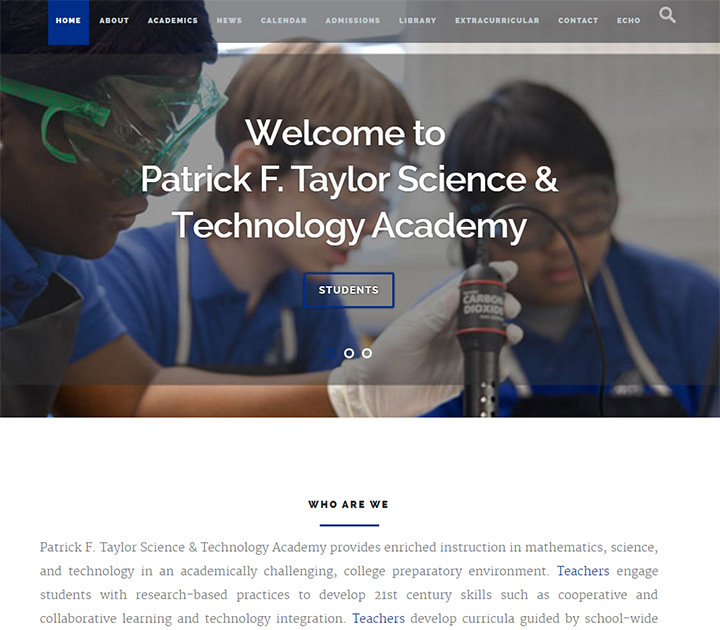 Students, parents, and faculty rely on a school’s website to find information about everything from after-school activities to upcoming events and yearly curriculum changes. 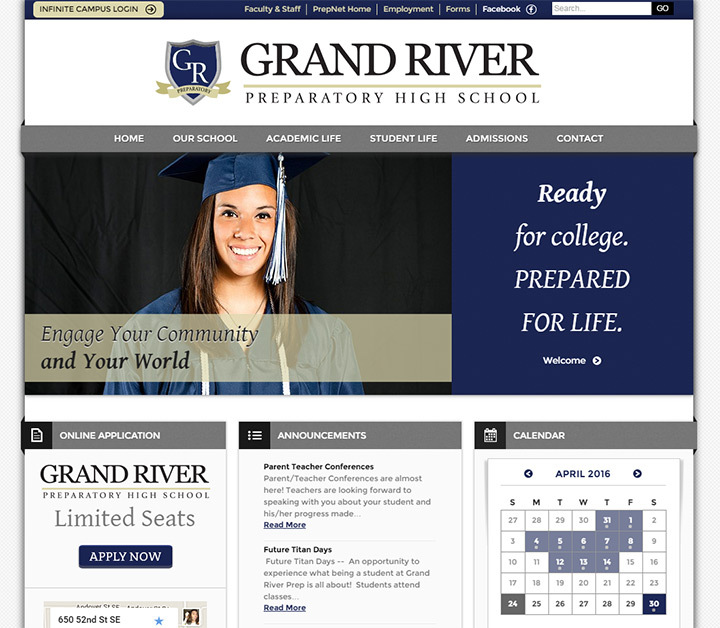 I did find one article talking about the best examples of high school web design, but it only features 15 examples. I’d like to provide detailed tips & examples for school districts and the webmasters that work for them. 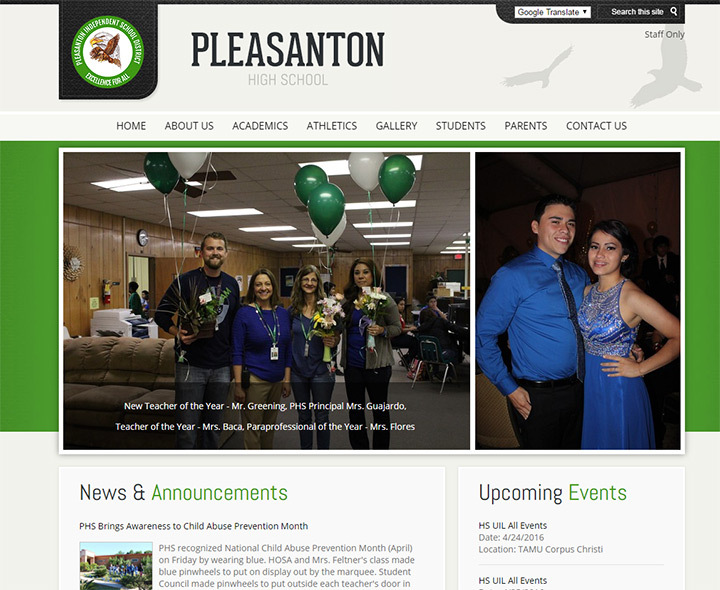 How can school districts improve their image and make their school websites function better? 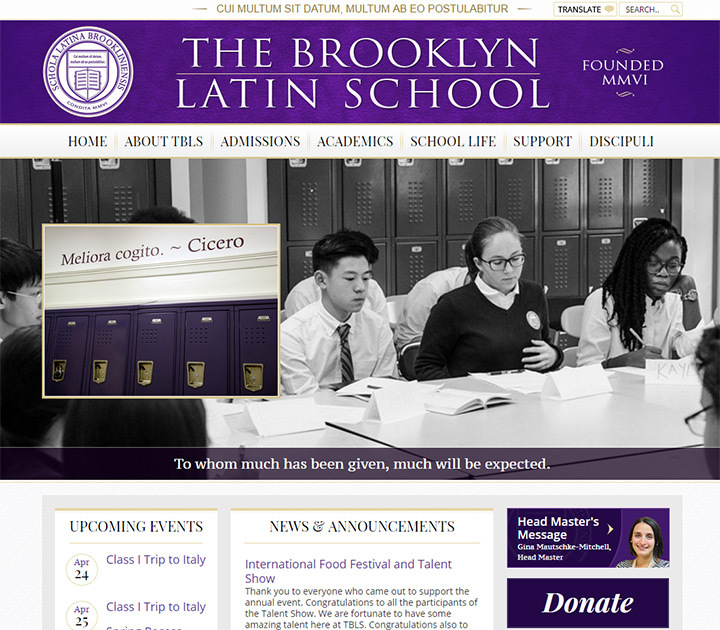 I’ll share some applicable design tips and techniques that can work on any high school website whether public or private. Schools often have the same audience of visitors and serve the same needs regardless of location. 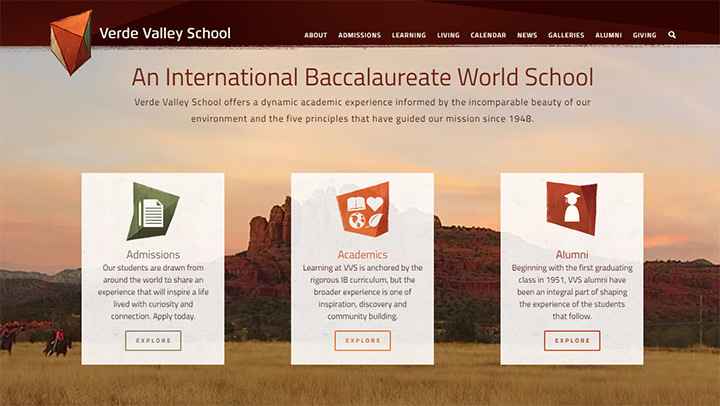 The following tips use live examples as case studies, and at the end of the post I’ve curated a gallery of well-designed high school websites for inspiration. 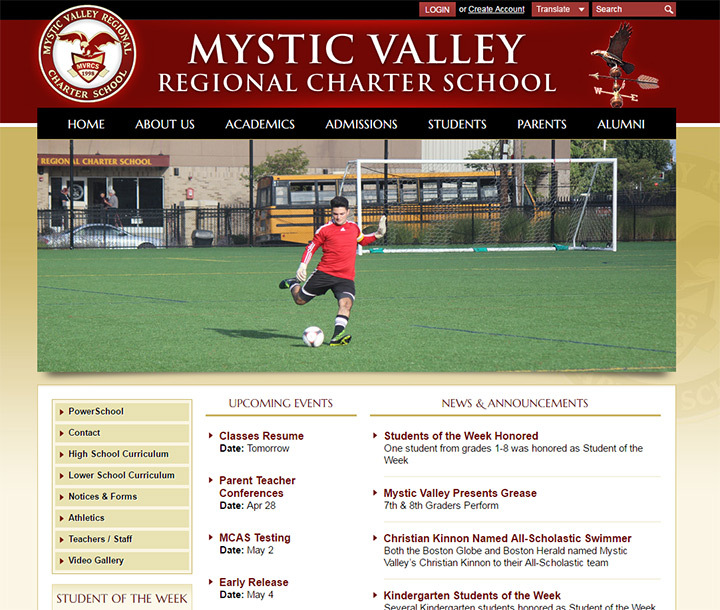 Most school websites contain an incredible amount of content. It’s useful content but this requires a deep navigation to help visitors find what they’re looking for. The best way to structure content is by first planning out the sections and subsections relevant to students, parents, and teachers. Some schools create different portals for information. 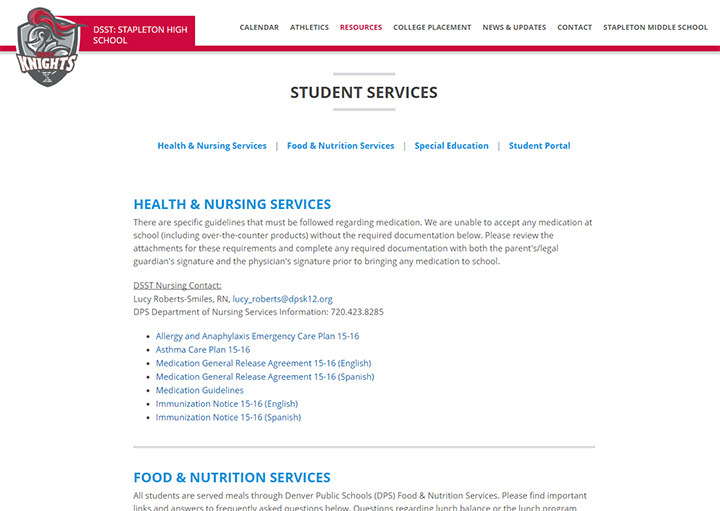 Other schools separate info into page sections based on categories. Ultimately the goal is to make it easy for any visitor to find the information they need. 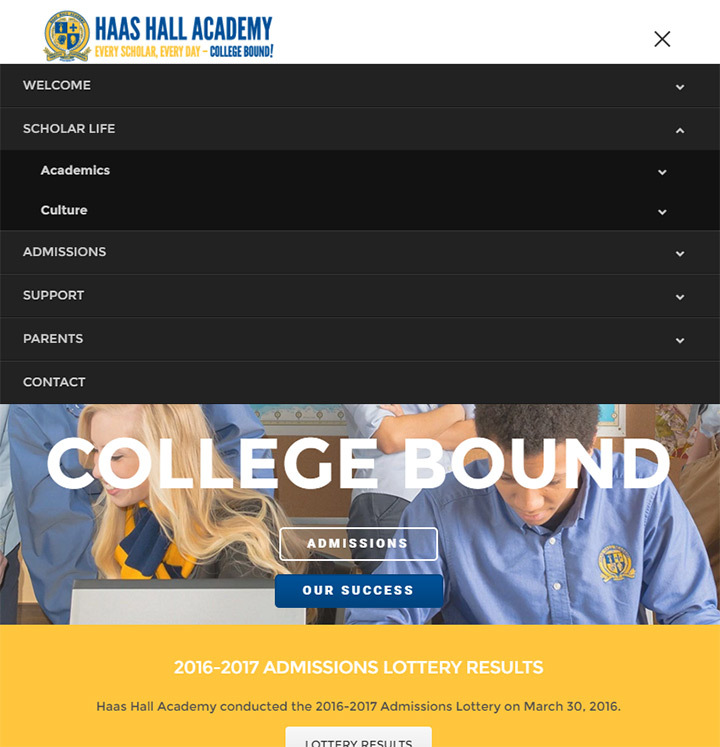 The nav text and dropdown menus for Haas Hall Academy are pristine examples of navigation design. Each primary link is clearly defined and there’s even a link labeled “parents” for parent-specific resources. This whole site just feels easy to browse and the typography is simple to read at a glance. The layout is responsive and on smaller screens the nav turns into a hamburger sliding menu. But it retains all the submenus and link hierarchy defined in the fullsize layout. 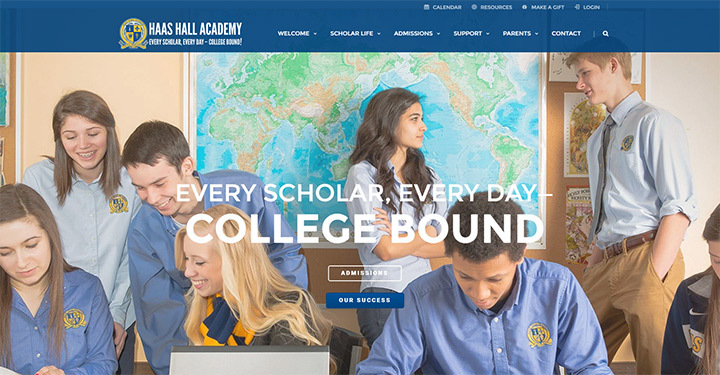 Every major facet of the Haas Hall Academy website fits into the model of a great high school design. It uses clean text and readable web copy to entice visitors further into the site. A slightly different example can be found on South Carolina’s SCGSAH website. Each navigation link has a dropdown menu with more accessible links. 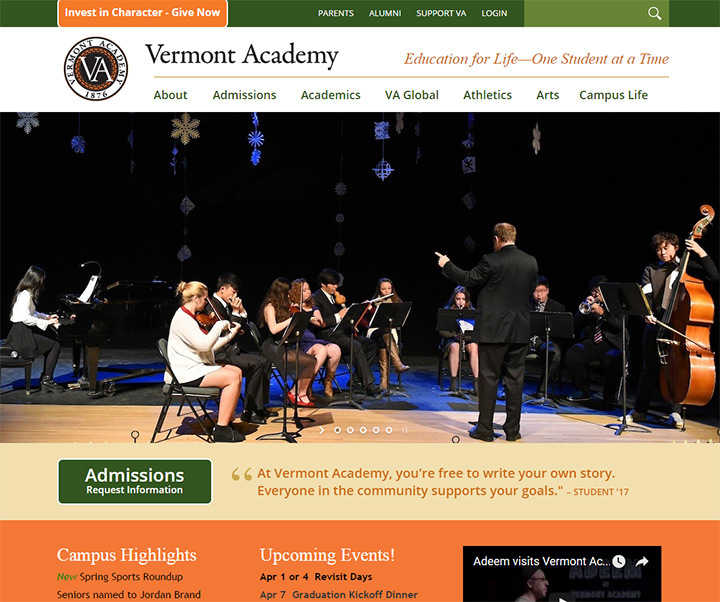 But the homepage also features a slider with individual links to areas of study like music, drama, and creative writing. You should cater the navigation to your typical visitors and their individual needs. People visiting the SCGSAH website may be looking for more information into each of these admission departments. But you’ll notice the department links are not the primary focus, or the only accessible navigation. 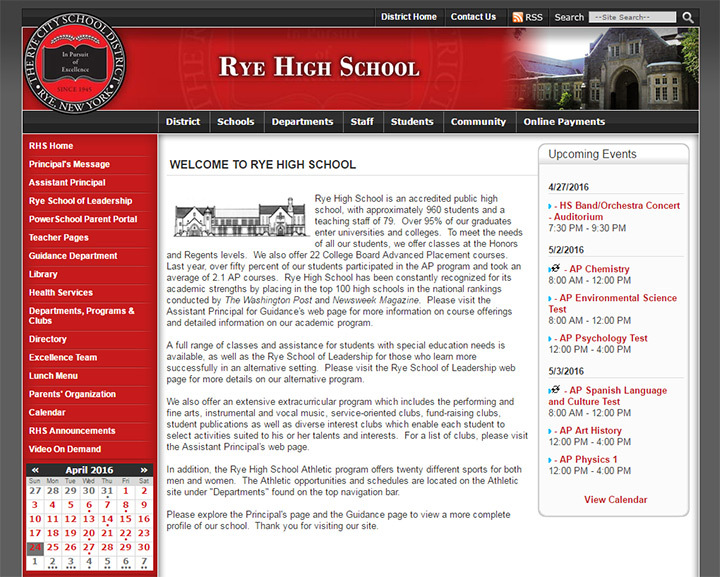 There should be as many links as needed to encompass the wide array of pages offered on a high school website. 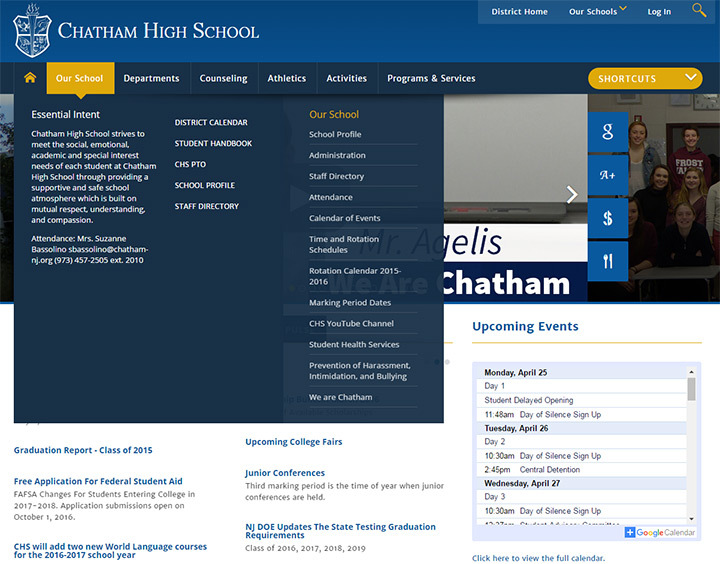 I feel like the Chatham High School website does navigation the right way. The very top navigation leads to the district site and other schools in the area. 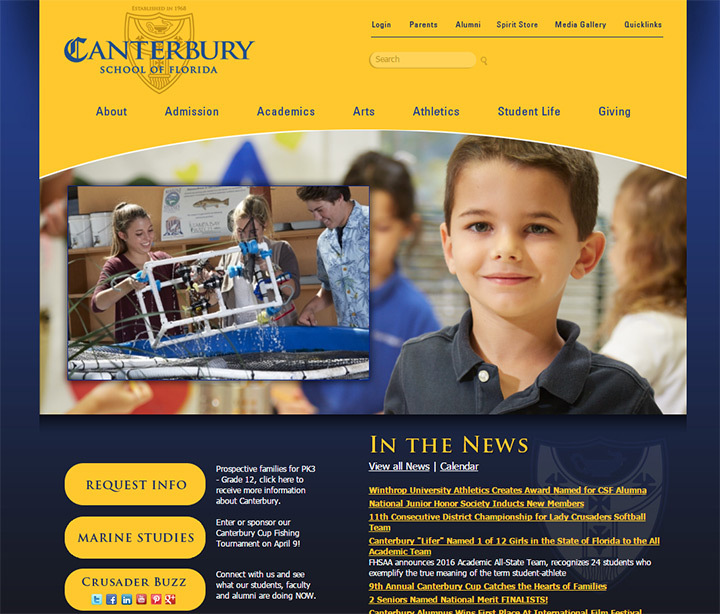 This connects visitors to the network of schools in the Chatham region. Each main navigation item has its own dropdown but they’re structured in different ways. Some dropdowns just contain a vertical list while others expand wider with multiple columns for all the available pages. This is a brilliant example of flexibility and diversification of design elements. There’s no need to only use a single type of dropdown if a multi-styled design could perform better. 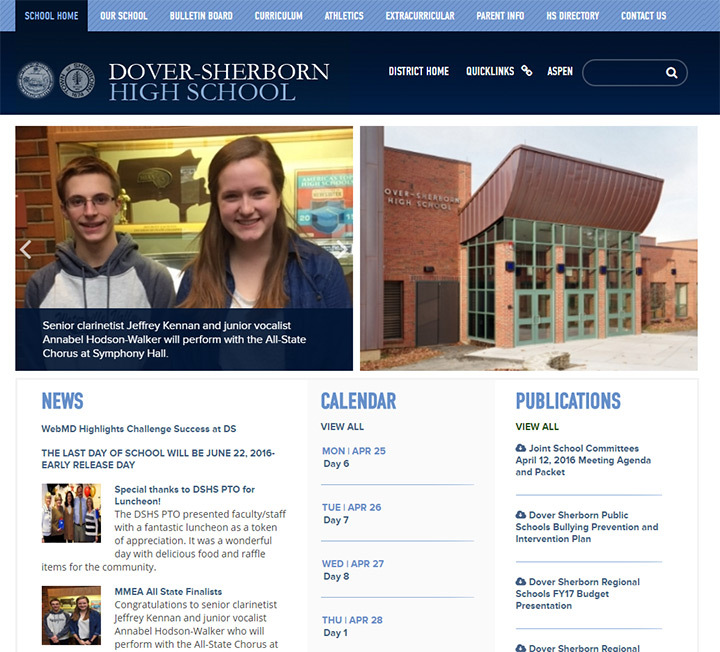 I also like Chatham High’s tabbed content widgets on the homepage. 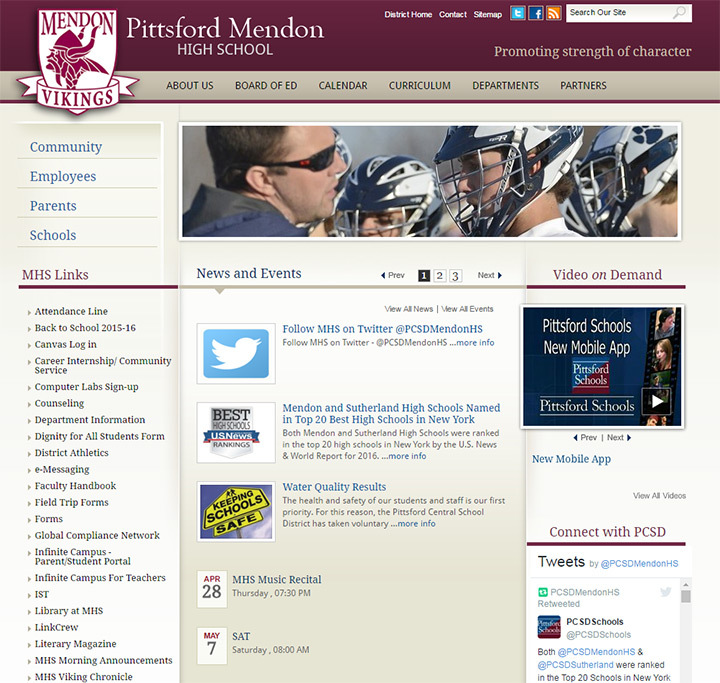 News and announcements are available at the click of a mouse and they’re featured prominently right on the homepage. This is the best way to share vital info like school closings, graduation ceremonies, school dances or plays/activities happening at the high school. Each district and school has a different set of priorities but they all share similar interests. I recommend planning a content strategy first before designing the navigation. Once you know how many pages are required and how they fit into a hierarchy it’ll be easier to design a functional navigation. Page text is the bread & butter of every major school website. Photos and videos are great for capturing special events, but they’re not as helpful with admission requirements or upcoming schedules. The use of clean typography goes beyond font choices. You should also consider the size and position of fonts in relation to each other. Nav links, page headers, body text, captions and other styles of text all need to create a hierarchy on the page. 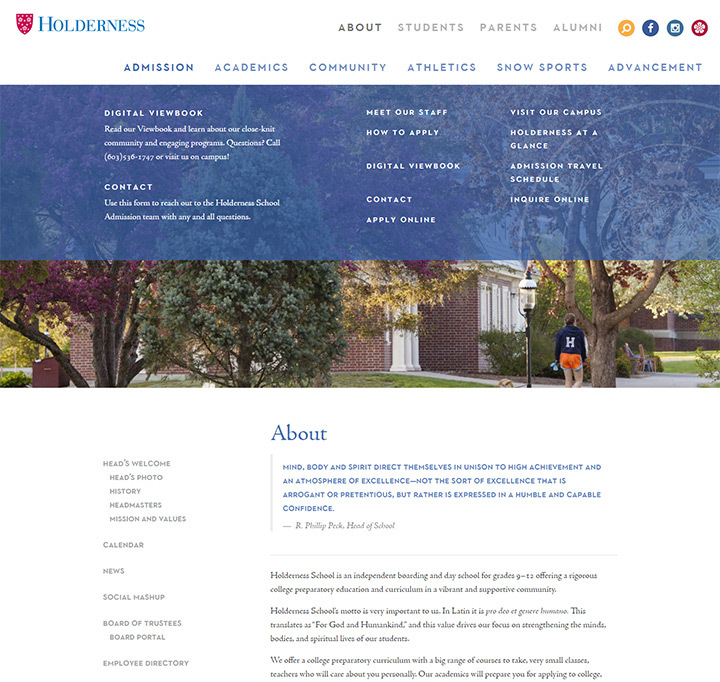 Holderness School uses large uppercase text for the navigation links. These immediately capture attention because they’re easy to read and take up a good portion of the navbar. And if you visit an internal page like the about page you’ll see the typography organized in a clear hierarchy. 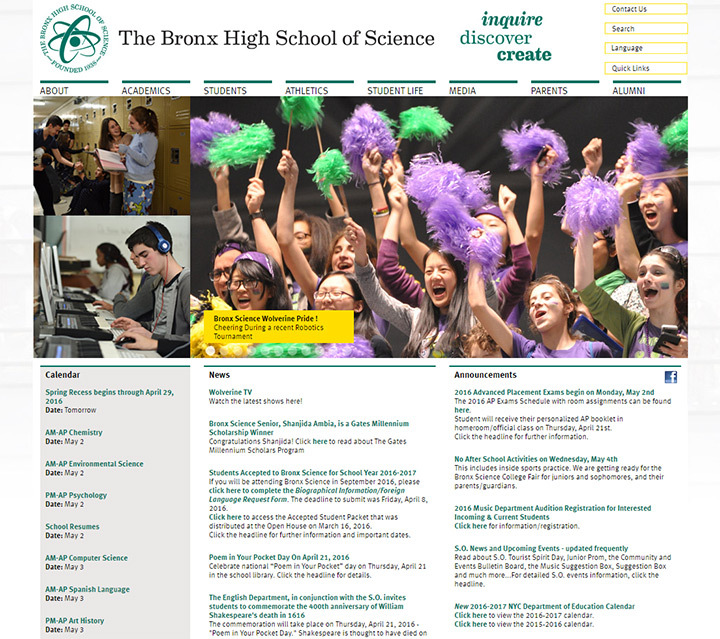 The page has side navigation links which also use the all-caps design. The headers are colored a dark blue along with the blockquote text. Notice how everything just looks professional. Even at a glance without reading the content you can tell it was designed in an organized fashion. Graphic design principles of typography also apply to websites and they’re handy if you know how to use them. Create diverse CSS styles to define different areas of text on the page. 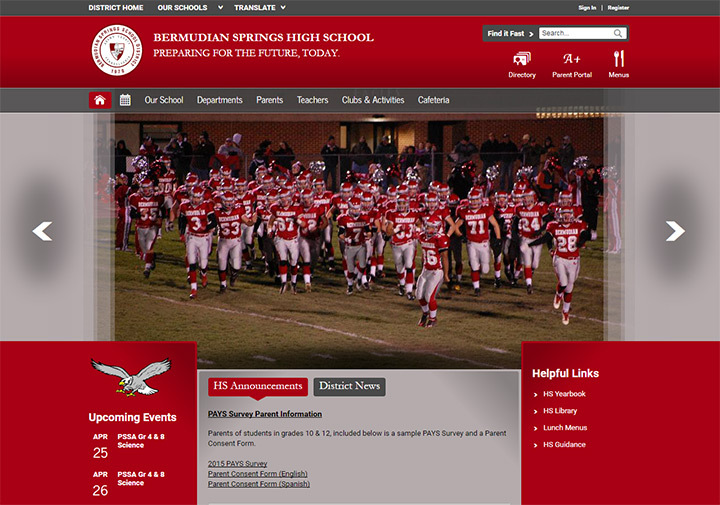 Bellarmine Prep has a grid-based website with multi-column pages and small page text. Some designers prefer to keep text small because it’s the traditional way of designing “professional” websites. This is a perfectly valid technique and should work across the board for any educational institution. But larger text is also OK it just depends on the implementation. Also look over the BCP site and notice how often the forward slash is used in nav elements. This can be found in the top nav and the footer links as a style choice to distinguish those links from the rest of the content. 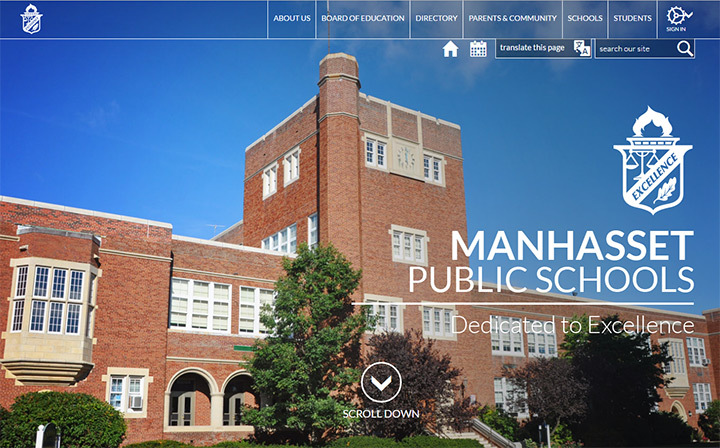 Take a look at the public school site for Stapleton High School. Their navigation uses uppercase bold text for top-level links and regular text for dropdown menus. When digging deeper into other pages you’ll notice many repeating trends in typography. Every main page header uses a top and bottom border to distinguish that text as the main page title. Some pages even have hyperlinks for on-page content so you can quickly jump to the section you need. 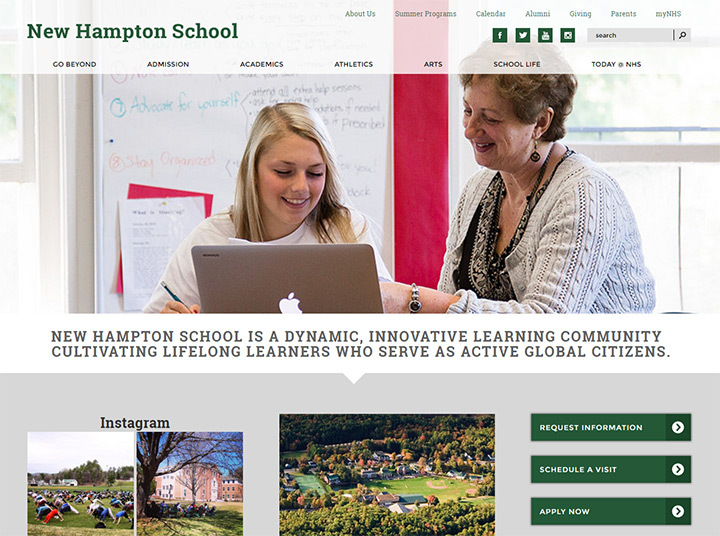 Buttons, hyperlinks, and paragraph text can all be designed to blend nicely with the overall layout. Most pages use a single column to keep focus where it belongs: on the content. Each layout will have a different method for organizing content on each page. But design patterns and typographic trends should be applied universally to visually distinguish the different areas of content. 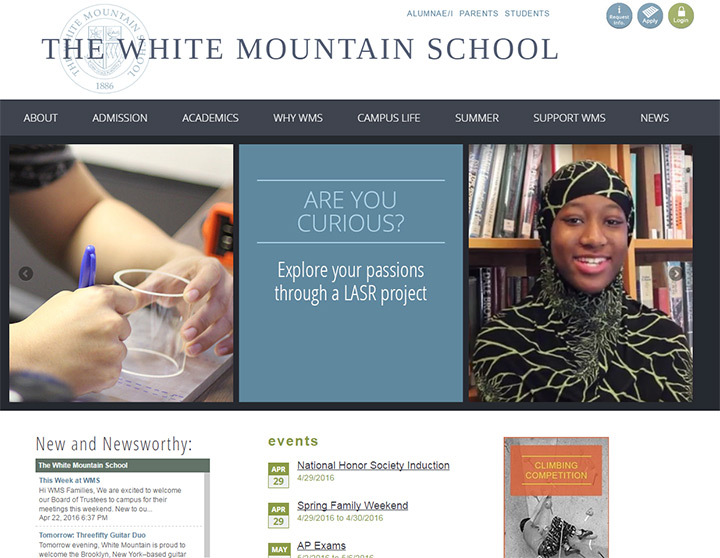 In a world of poorly constructed public school websites it can be difficult finding quality inspiration. This is why simplicity might be the best way to avoid eyesores. Focus more on the user experience and page content rather than flashy graphics and aesthetics. Granted there’s always room for visual design work, but sometimes the simpler designs can actually look better. 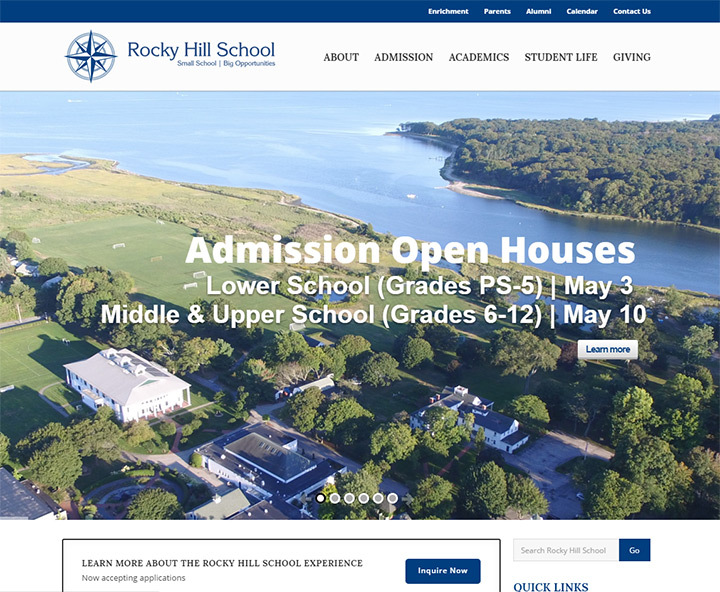 Rocky Hill School in Rhode Island uses flat colors and typographic styles as the cornerstone for their layout. Photos are a powerful touch that breathe life into the page, but they’re secondary to the content and user experience. 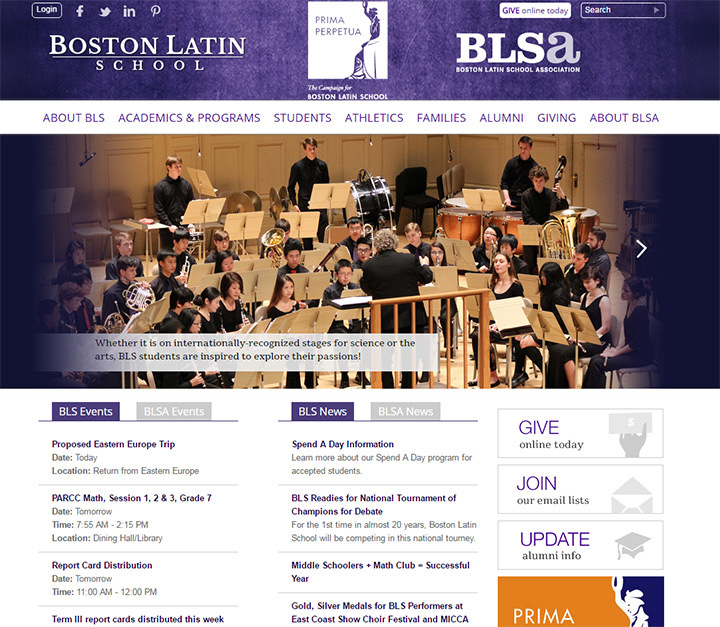 The site header contains two navbars with one covering general links for parents & alumni. 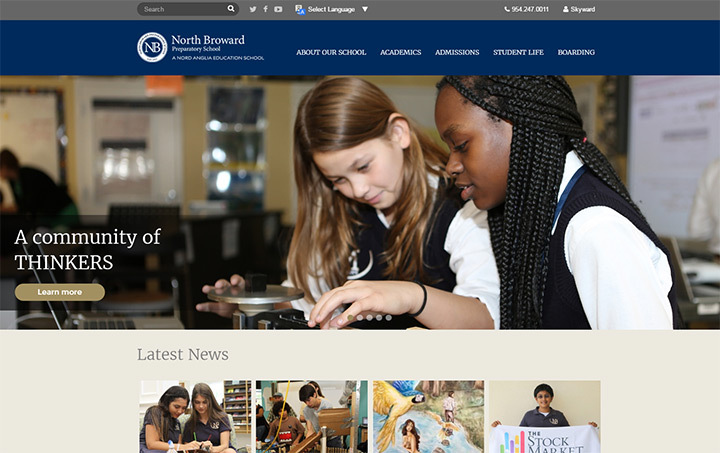 The primary nav has more topical links about the school curriculum and student info. 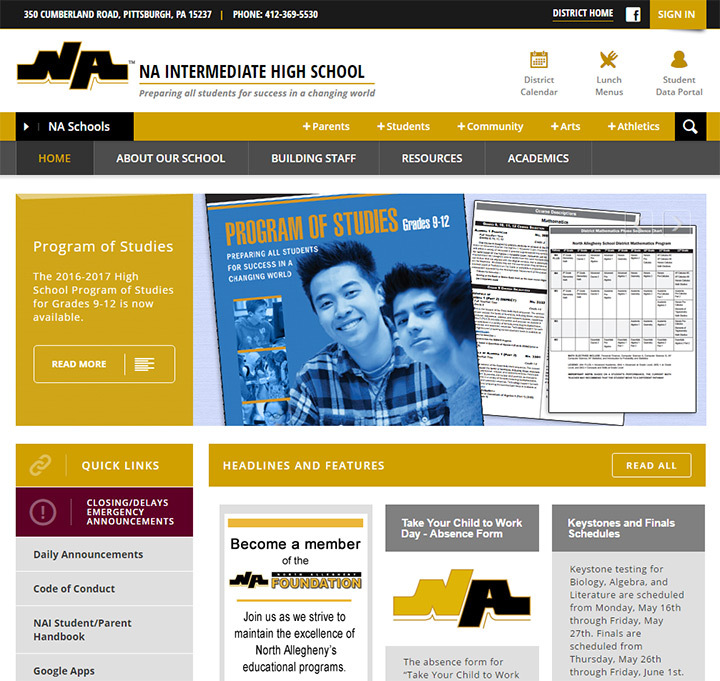 Aside from the school’s logo there aren’t any other graphic icons on the page. There are plenty of photos which look fantastic. But photos can be worked into any layout to give it a more personal touch. Take a look at the High Mowing School webpage to find many of these same features. Simple logo, clean navigation, and most page elements are designed with basic CSS. 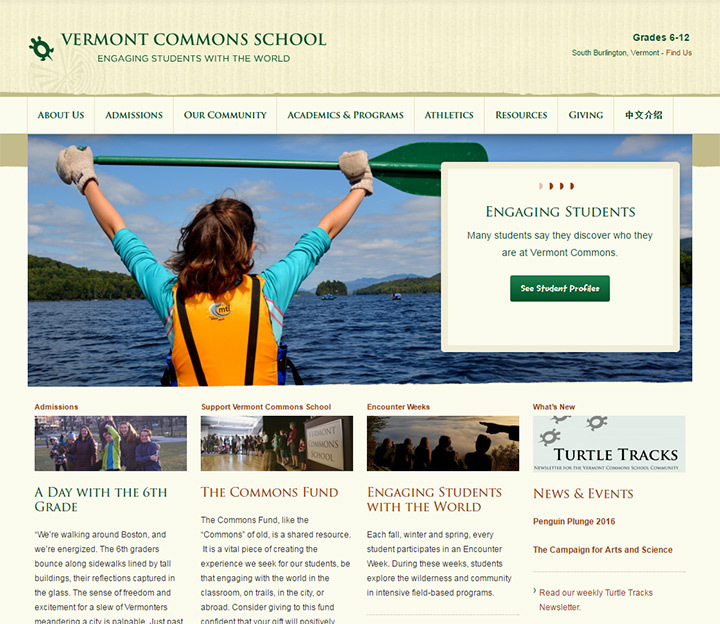 Content is often very complex on a school website. That’s why I suggest planning a content structure before designing the layout. But even with a complex page structure you can still run a minimalist design with plenty of success. Every visitor on a high school website just wants to find the information they need and move on with their day. This does not require any special graphics and I hope examples from this article can prove that to be true. 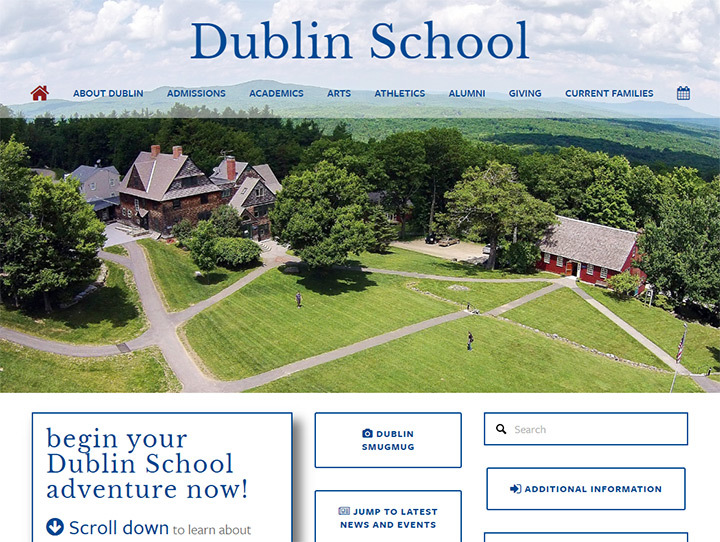 Classic web design techniques have remained popular for 20+ years for good reason: they work. Think how many websites place their logo in the top-left corner. And think how many websites place their main navigation near the very top of the page well above the fold. These trends are repeated because they work and they’ve become expected design patterns from almost every person on the Internet. 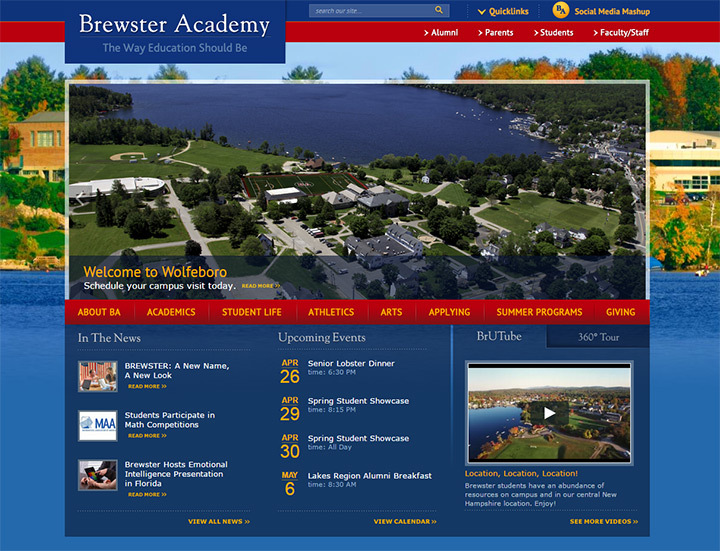 The homepage for Brewster Academy follows many traditional UX design patterns. 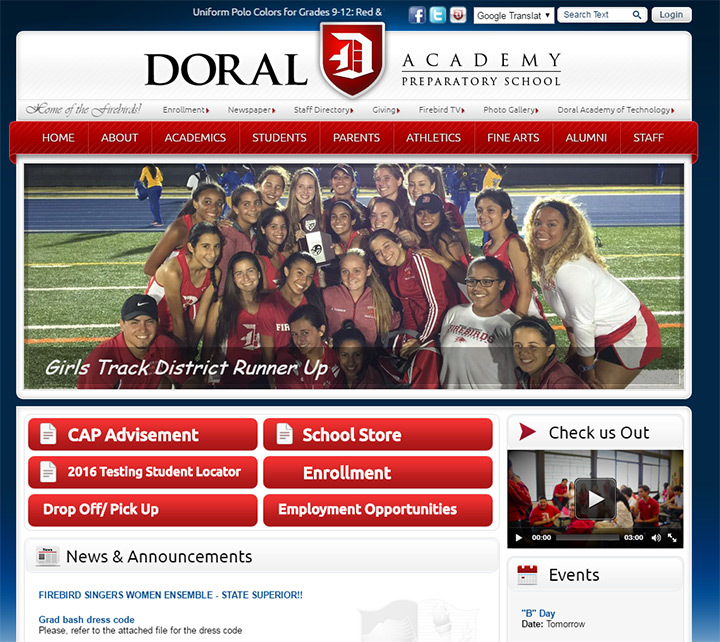 The top-left logo is prominent and defines the brand of the website. 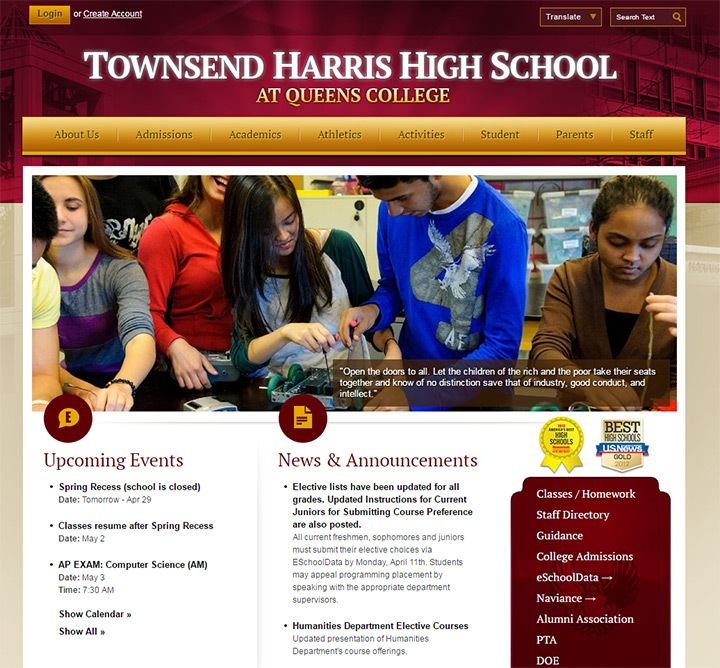 In the navbar you’ll find a list of quicklinks and other top pages for parents, students, alumni and faculty. But alternate nav links are situated in the center of the page near the top header photo. Content just flows naturally and guides your eye to each section of the page. Same with footer links organized into columns like you’d find on most content-heavy websites. 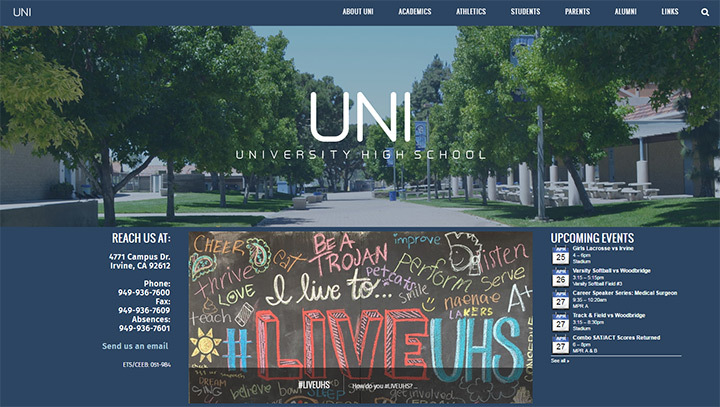 As you browse through other high school sites you’ll find similar UI/UX patterns that can be duplicated to improve any school website. 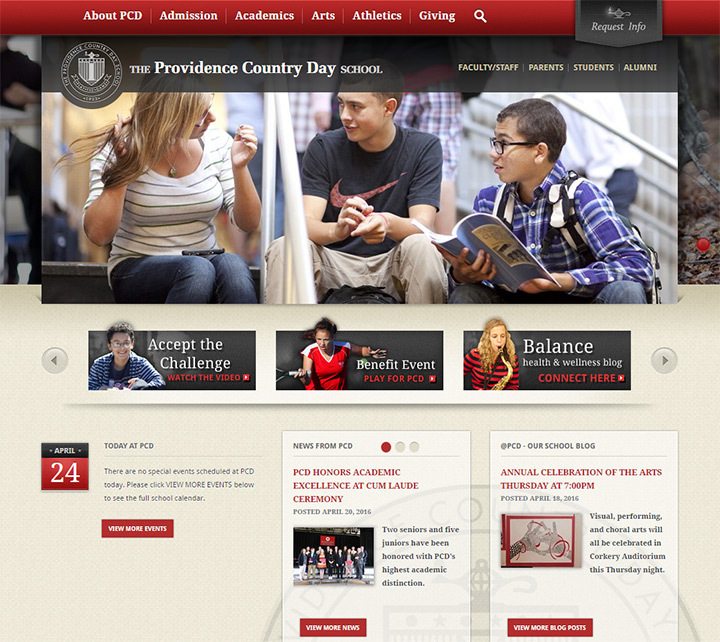 Providence Country Day places their navigation at the very top of the page. 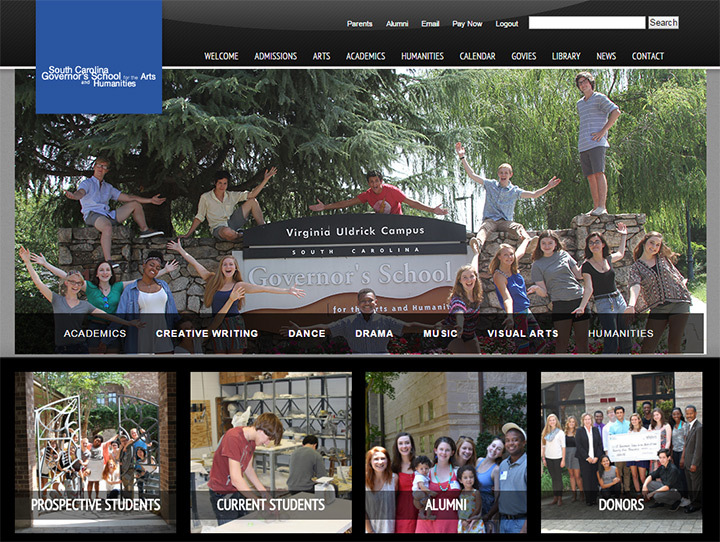 But links are scattered all over the place, especially in the footer which incorporates heavy branding into the layout. The nav is stickied to the top of the page and scrolls with the user. Dropdown links are super easy to read and don’t take up much room considering how many links there are in the menus. I also like the layout design using a three-column grid to organize distinct content on the homepage(calendar events, news & blog posts). Like with all web projects, each site is different with different requirements. Look through many different examples in this post to build a visual library of ideas which can be applied to your own project(s). Also try looking around at other design patterns to see if there’s any ideas you can borrow from non-educational websites. 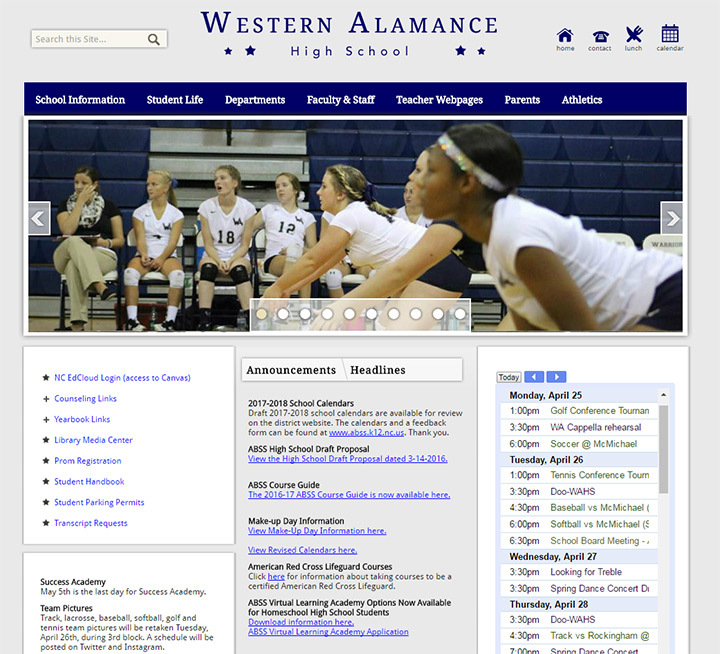 Few students need to access their own school website once they’re already enrolled. 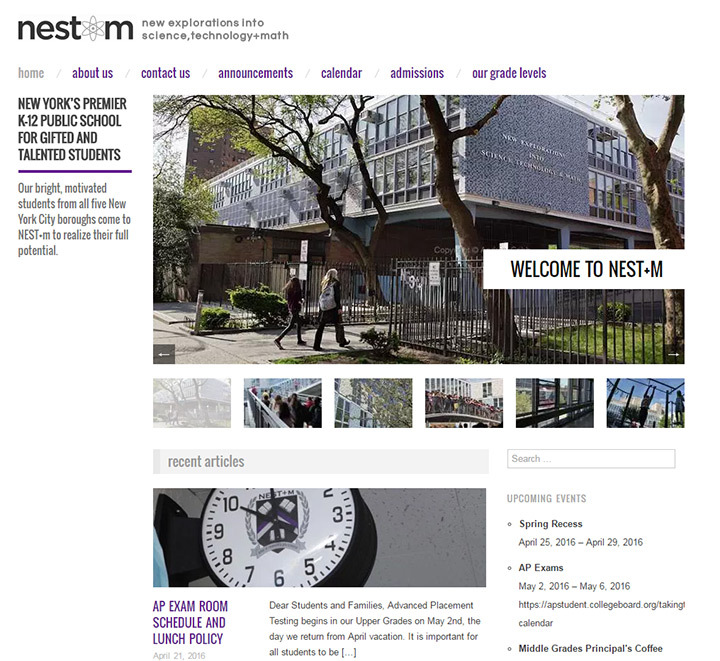 If students do need the website they’re often told exactly where they need to go, and if they can’t find something they’re surrounded by school faculty 5 days a week. Parents, teachers, and potential students are the ones who need to access information the most. Think about what sort of content is most useful to typical visitors and cater your design to that audience. It may be difficult figuring out exactly what these groups of people need from the website. In that case try polling individuals or sending out brief surveys to parents/teachers asking what information they need from the website. User research is a great way to plan your project and determine your goals when you feel directionless. 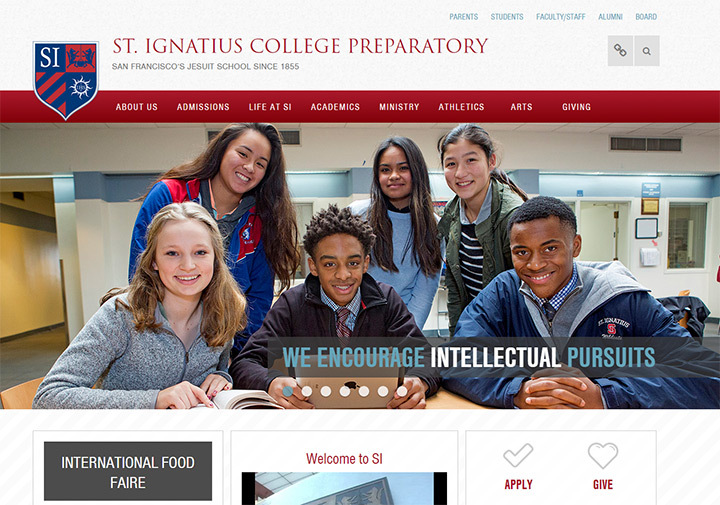 Take a look at the navigation for St. Ignatius College Preparatory. Their website has a red navbar with a very wide dropdown menu of further links. 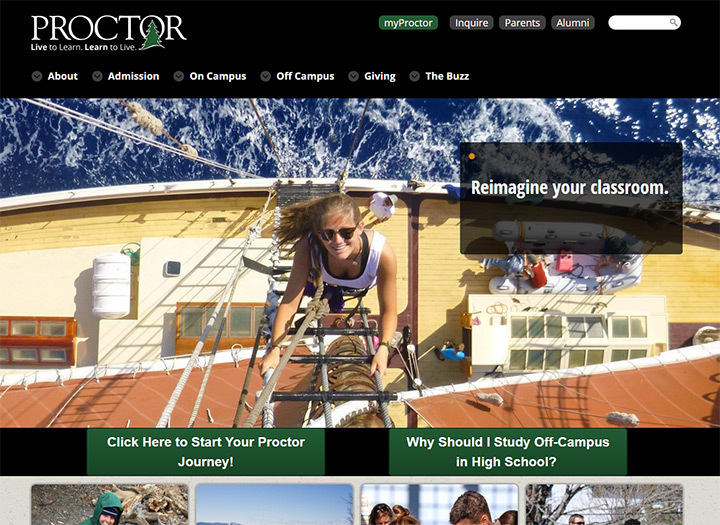 Then there’s also a top nav section with page links for parents, students, alumni and faculty/staff. This can be a great way to separate content and clarify distinctions between content areas on the site. Each person visiting the site typically falls into the group of parent, student, faculty, or alumni. 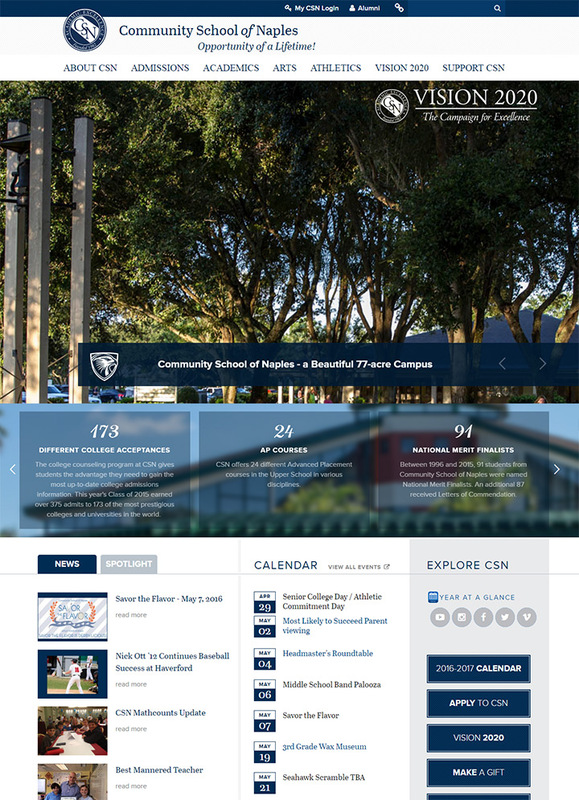 The primary navigation has all the other content for admissions, academics, athletics, and other page categories. Do your best to congregate all primary links together, even if they’re located in separate navigation menus. Visitors should land on the page and know exactly where they want to go first. 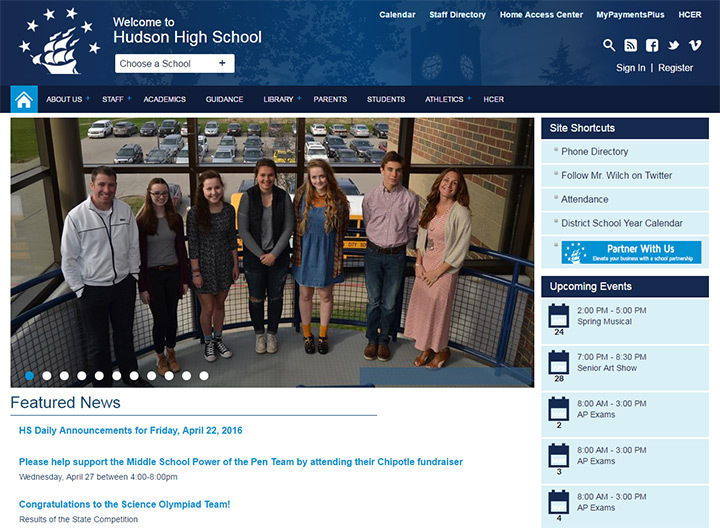 Another good example is the navigation for Hudson, Ohio’s Hudson High School webpage. 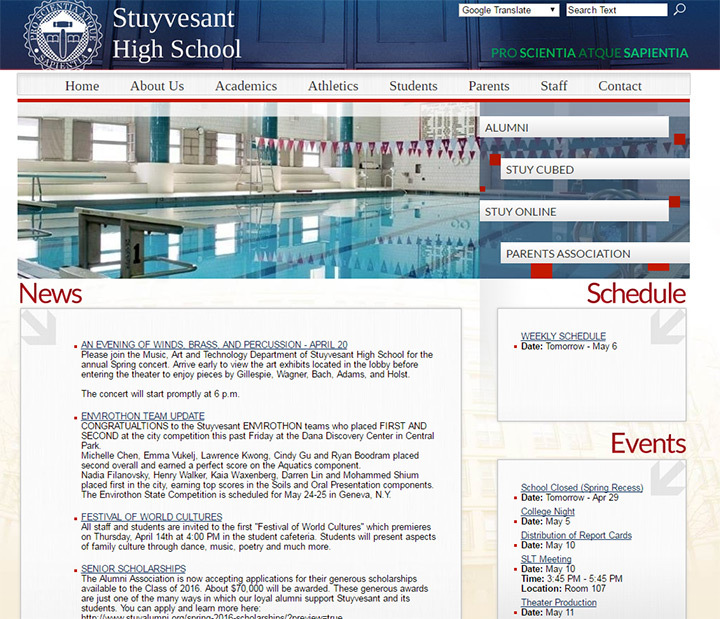 It has directory links for staff and parents, plus a list of calendar events in the homepage sidebar. These are relevant to everyone so it’s a safe bet to add these onto the homepage. 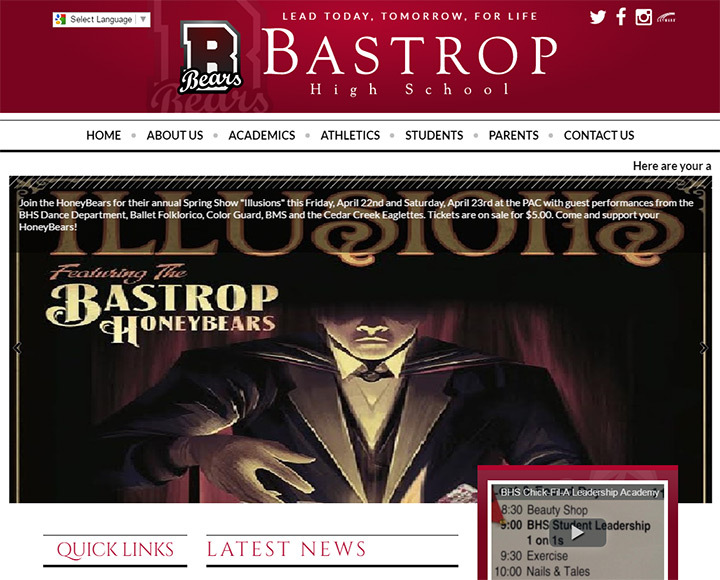 Most people want to know about current happenings at the school, so there’s also a big section of the homepage dedicated to current news. This should be a staple for every school website to keep everyone up-to-speed on current events. 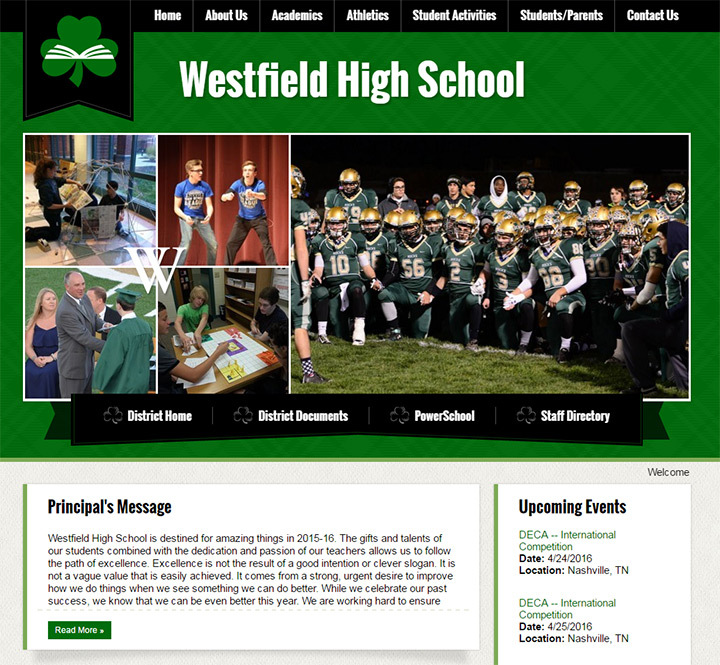 Feel comfortable reaching out to school administrators and others in the community to ask what they want from the high school’s website. Content basically defines everything else so be sure to craft a good content strategy before designing the layout. 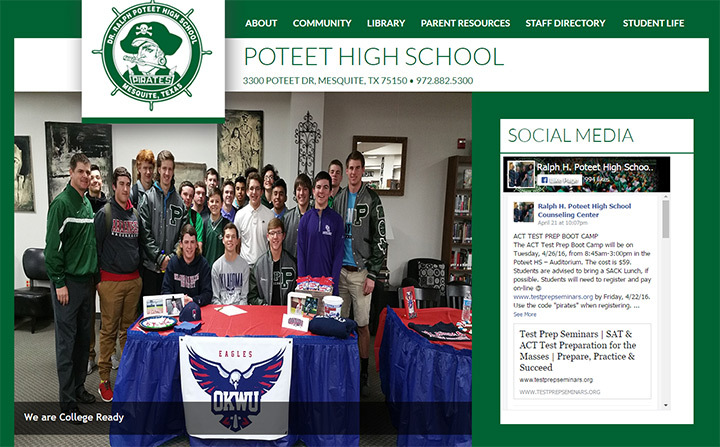 It’s always a good idea to add photos to every high school website. It gives teachers and students a chance to be spotlighted as part of the school’s community. 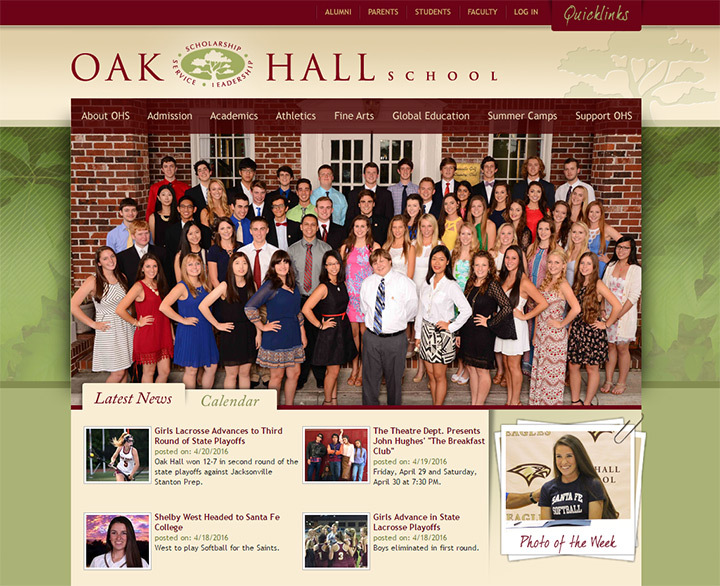 Everyone loves to see themselves, their team, and their work on the official school website. Plus it’s nice to show the interior/exterior of the school when possible. Not everyone can capture HD photos but many schools do have a photography teacher, or an art teacher with a photography hobby. Even the iPhone camera has come a long way and would be a viable tool for snapping candids. 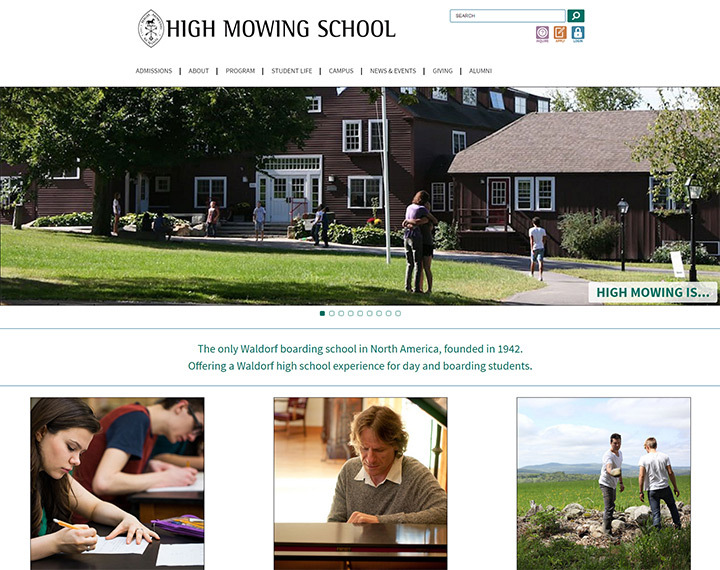 Try to gather at least a few images of the school, the students, and the faculty to add somewhere on the site. 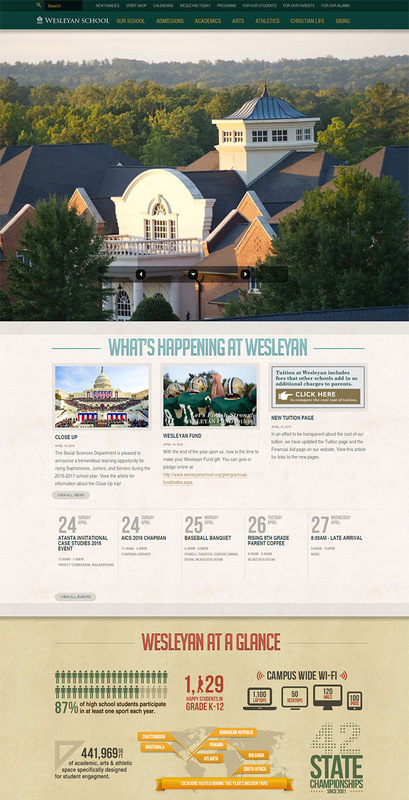 The Wesleyan School homepage uses a fullscreen slider of photos with students in action. These action shots are great because they show off the school’s extracurriculars like sports and musical talent. Scroll a little further and you’ll find other photos littered all over the page. 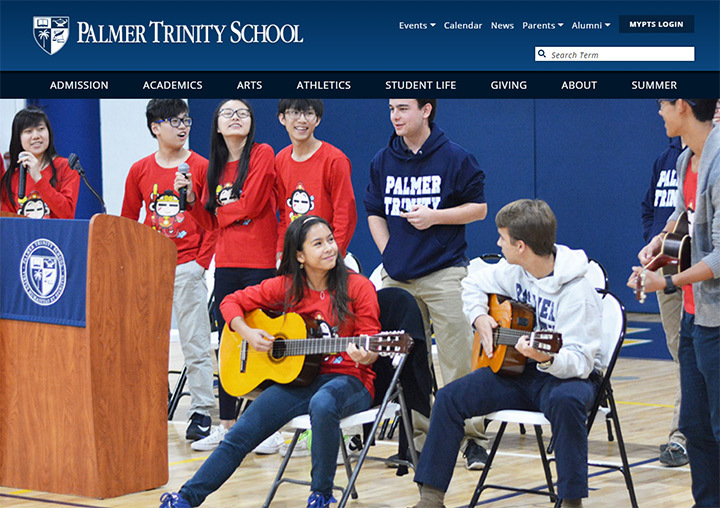 The school’s news page adds a photo to each news item which most often increases clicks & attention. This can be found in various studies with tweets and infographics. These photos do not need to be magazine spread quality. 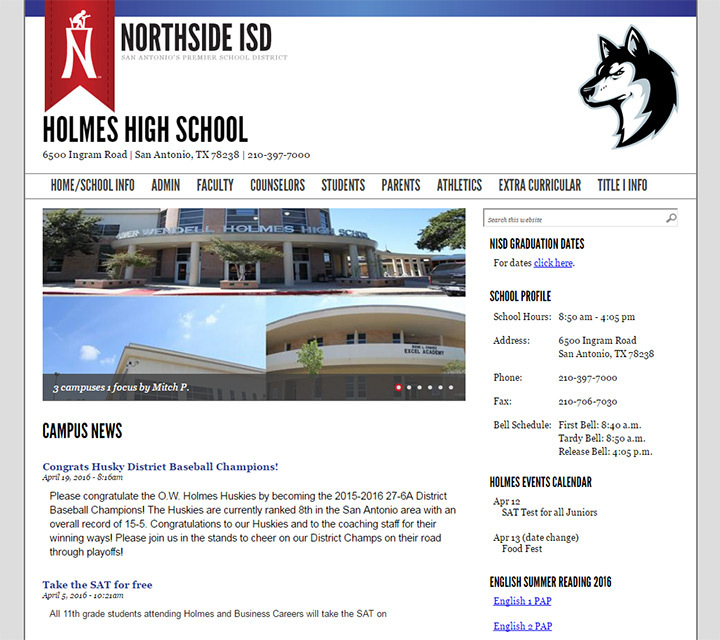 They just need to be good enough to blend with the site design and give a realistic sense of being at the school. I don’t want to say that photos are mandatory for a high school website. But they add so much to the content and the atmosphere that I guarantee every school site would look much better with some relevant photography. Most public schools tend to have poorer designs than private schools. This may be due to budget constraints, the lack of a technical staff, or less of a need to entice parents/students. 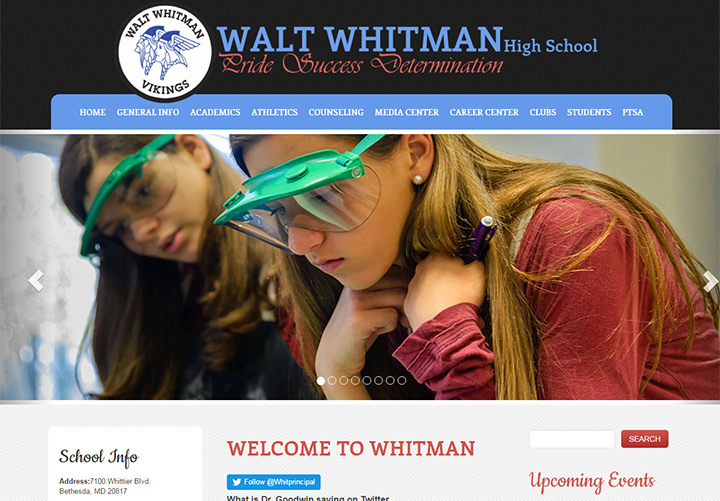 But generally speaking you’ll find the most professional designs on private high school websites. So how do you define a professional look? 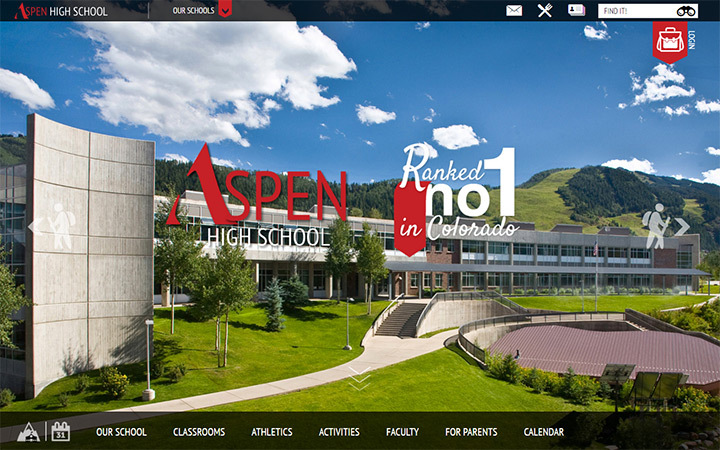 It’s tough to explain and involves many design concepts like whitespace, composition, typography, rhythm, and symmetry. But you don’t need to be a great designer to understand these concepts. Everything can be picked up by studying “good” websites and replicating the elements you like best. 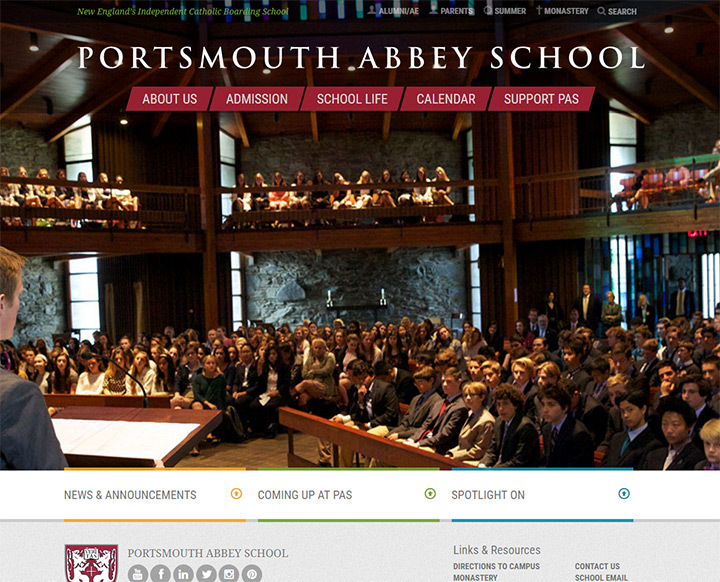 Take for example the Derryfield website. Nav links are big and bold with a defined typographic style. There’s plenty of space between links and there’s enough contrast to read through the text quickly. Secondary & tertiary navigation links are placed right underneath the main navbar with an optional search form. 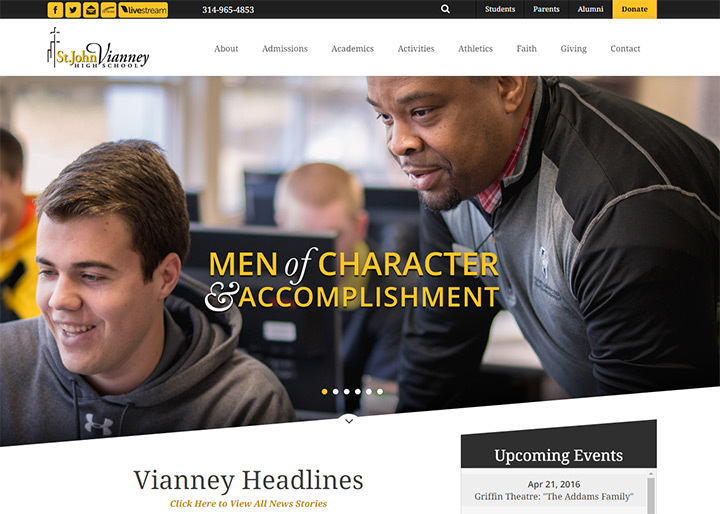 All of these elements blend together with a consistent style and plenty of whitespace. 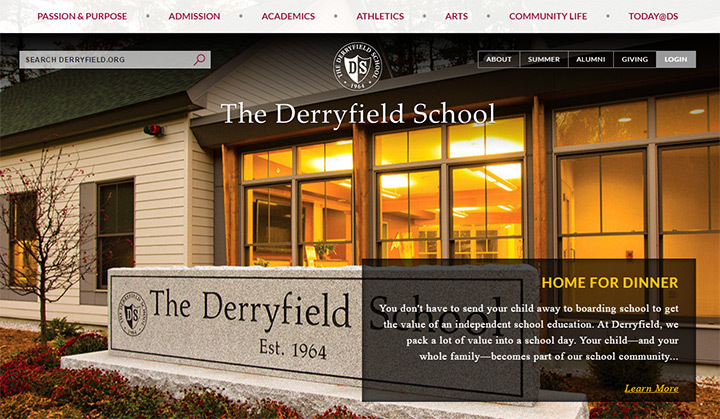 The Derryfield site also uses large fullscreen photos for a homepage slideshow to draw visitors further into the school. It’s fully responsive and has some wonderful page copy like the “home for dinner” slide in their slideshow(pictured above). 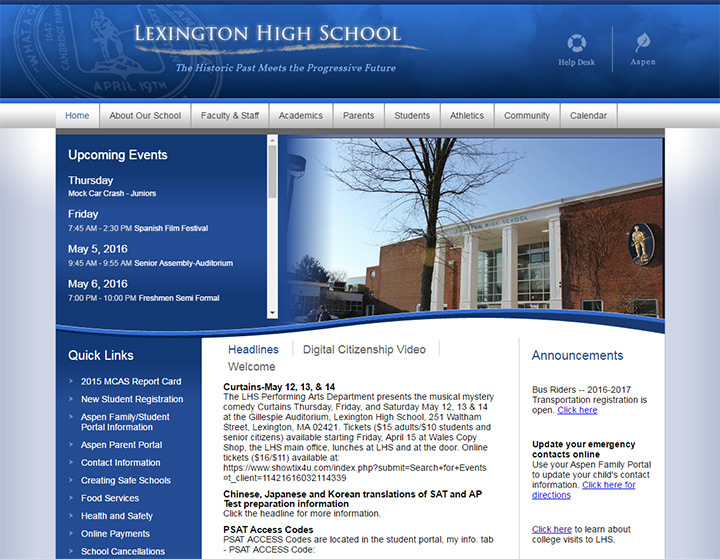 From first landing on this page you can tell it has a much better design than most public school websites. But it’s not one single thing that makes it look good. It’s the overall composition and style that gives it a professional look. This is why you should copy other websites by studying which elements you like the most. I recommend the short book Steal Like An Artist by Austin Kleon, in which he explains the process of how most creatives copy ideas from others. Just remember that user experience and UI design both need to work in tandem. 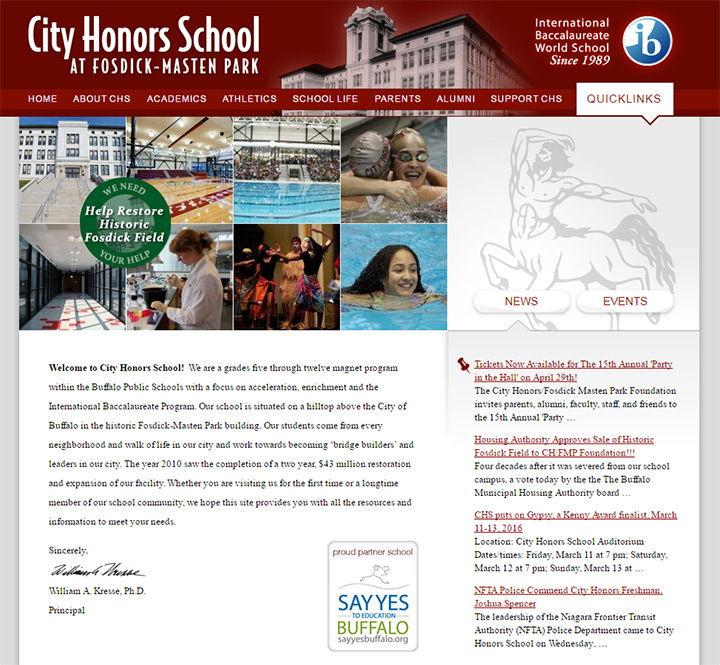 All professional-looking school websites also function very well and serve their target audience. 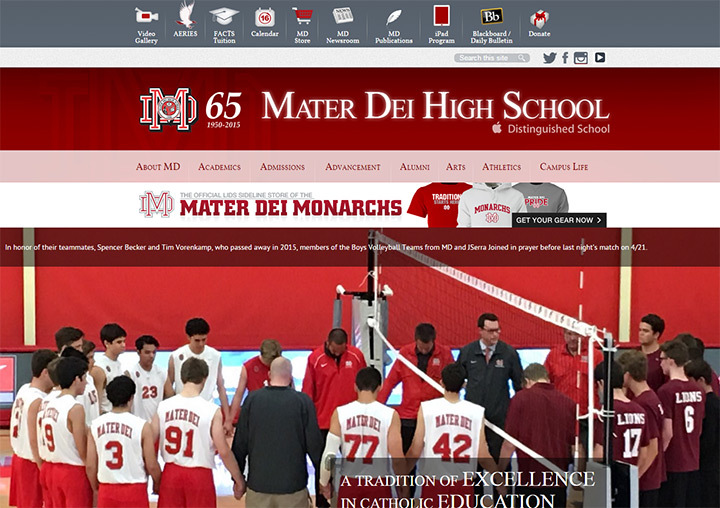 For example Mater Dei High School is perhaps one of the flashiest designs for a school website. 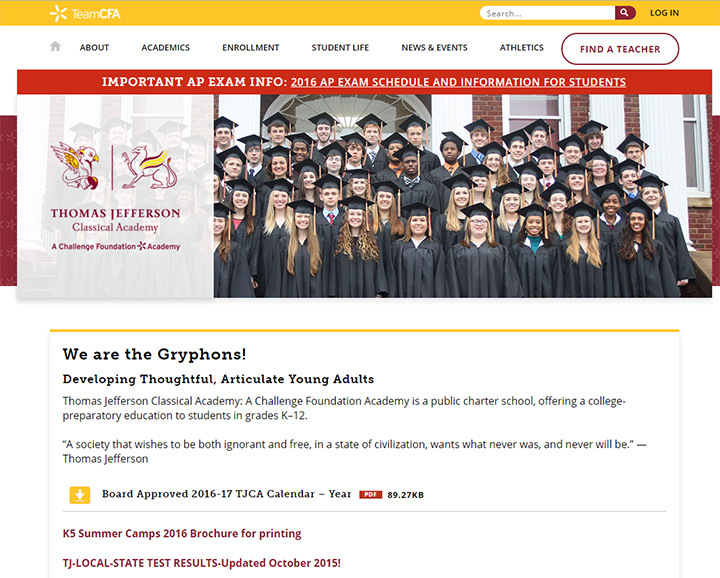 It uses icons in the navigation bar, a banner to the school store, and includes a blurb recognizing that the school is an Apple Distinguished School. But I have to say it’s not one of the easiest sites to use. There are two different “primary” nav menus and it’s difficult to know where to browse. Plus the dropdown menus have a dim opacity on the background, making the links very difficult to read. This is an example of a nicely designed site aesthetically, but not great functionally. I wouldn’t say it’s a bad site. But I think it could use improvements in the UX department. Try your best to bring together UI design aesthetics with UX design principles. Learn from other websites and borrow ideas from dozens of different sources. If you can do this successfully you’ll end up with a high school website that fits with the community and functions well for everyone. 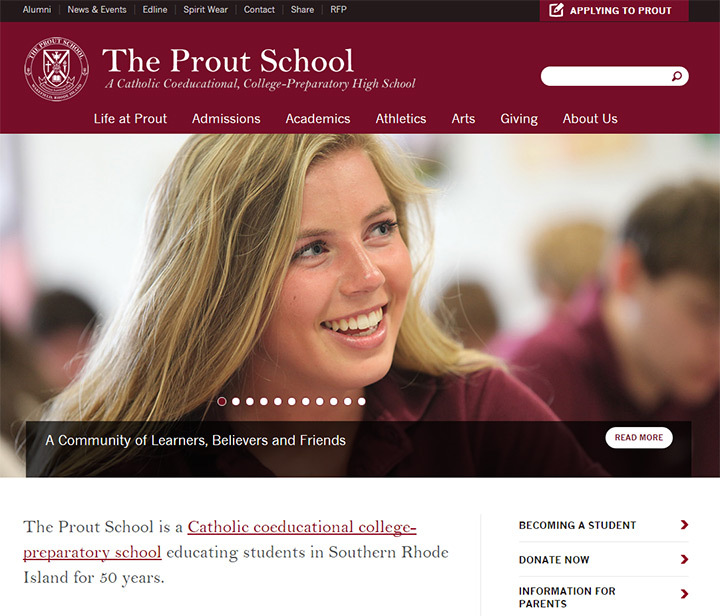 The following examples show real websites of public and private high schools that demonstrate quality techniques in UI and UX work. Each site follows most of the trends I’ve outlined in this post so they’re worth emulating whenever possible.